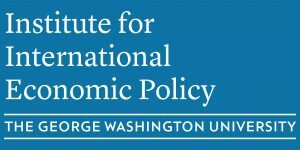 The George Washington University has a wealth of courses related to international economic policy at the undergraduate level. All economics courses listed below presume that students have current knowledge of introductory economics principles courses (Econ 1011: Principles of Microeconomics and Econ 1012: Principles of Macroeconomics). Where applicable, syllabi have been posted. Note: Courses designated Econ 2195 are special topics courses that are offered occasionally. Theories and empirical studies of the economic problems of developing countries. Econ 2180 Survey of International Economics. Theories and policy analysis of international trade and international finance/macroeconomics. Econ 2181 Survey of International Trade. Focus on the origins and effects of international commerce among nations. Particular attention on trade policy, the World Trade Organization, and free trade agreements. Econ 2182 Survey of International Macroeconomics. Analysis of international financial flows, including determination of foreign exchange rates, macroeconomic policy in an open economy and the effects of balance of payments on economic conditions. Econ 2169 Introduction to the Economy of China. Background, organization, and operation of the emerging Chinese economy. Appraisal of performance and analysis of problems of development. Econ 2170 Introduction to the Economy of Japan. Analysis of the structure and growth of the Japanese economy. Econ 2185 Economic History and Problems of Latin America. Analysis of past and present economic policies in Latin America. Includes analyses of the specific historical and policy structures and problems of Latin American economies. This course will look at the theory and practice of the WTO during its first 10+ years of operation. The course will begin with a broad overview of the WTO and its history. We will then move into a more detailed examination of each of the sub agreements, including Agriculture, Services, Textiles, intellectual property, administered protection allowances, etc. One method we will use is to study various dispute cases that have been brought before the WTO on each of these issues. Thus, students will leave the course with a good deal of knowledge about many dispute settlement cases during the past 10 years. Finally we will also discuss the Doha round, its agenda, and prospects for the future. Basic economic analysis will be introduced, as needed, as we discuss each of these issues. Note: this class will fulfill a WID requirement. Econ 2123 Introduction to Econometrics. Construction and testing of economic models regression theory, parameter estimation, and statistical techniques applicable to economic models. This course will use microeconomic tools to analyze a variety of environmental and natural resource problems and policies. Economic reasoning will be used to examine the causes of environmental/resource problems, the consequences of these problems, and the measures for dealing with them. Industrial Organization is a subfield of microeconomics devoted to the study of firms and markets, focusing in particular on how firms acquire market power, how firms use this power once acquired, and how competing firms interact strategically. The development of non-cooperative game theory over the past several decades has provided new, formal tools to study these issues and has led to an explosion of interest in industrial organization. Many of the lectures will be theoretical, but there will also be discussions of policy issues and empirical methods. While this course deals with the expenditure/regulatory side of the government’s budget, it does not provide a detailed review of such programs, such as education, health care, or national defense, that will be found in most countries. Rather, the course provides a thorough introduction to the sorts of efficiency concerns that account for most public sector spending and regulation. To this end a significant amount of time will be devoted to understanding market failures and policy design issues that underlie most expenditure/regulatory programs. This is a WID course, so there will be writing assignments that focus on writing within economics on issues related to material covered in the course.